Join us for an afternoon of Bunco hosted by your neighbor. Please bring an appetizer or dessert of your choice to share. Bring along the recipe too (if you don' t mind sharing, lol). bring (1) $10 bill and (3) $1 bills. Visit https://www.youtube.com/watch?v=XhQnraJx9v8 to learn how to play! 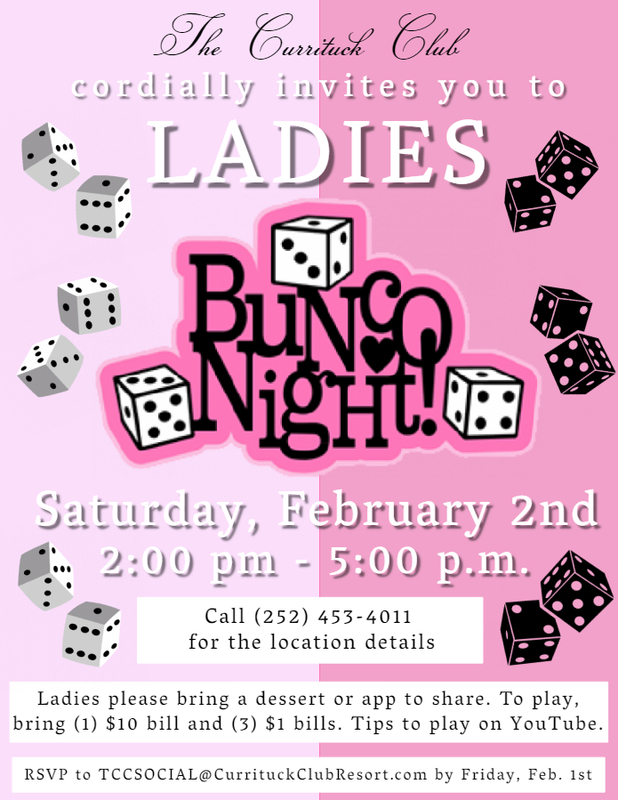 There will be a minimum of 8 attendees to play Bunco. RSVP to TCCSocial@CurrituckClubResort.com by Friday, February 1. This will be a recurring event. please let us know in your RSVP. Call the Fitness Center at (252) 453-4011 for the location!